Donald Trump continues his feud with George Conway, a conservative lawyer and the husband of White House counselor Kellyanne Conway, and Dr. Phtrevor steps in to mediate the crisis. 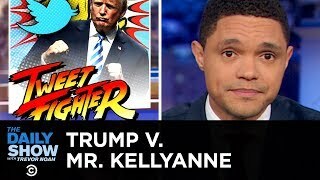 to The Daily Show Follow The Daily Show Twitter Instagram Watch full episodes of The Daily Show for free Follow Comedy Central Twitter Instagram About The Daily Show Trevor Noah and The Worlds Fakest News Team tackle the biggest stories in news, politics and pop culture. The Daily Show with Trevor Noah airs weeknights at 1110c on Comedy Central.